If you find your dentist telling you to floss more, you may be interested in Bacon Floss ($4.95). It’s like regular floss, only it tastes like bacon. 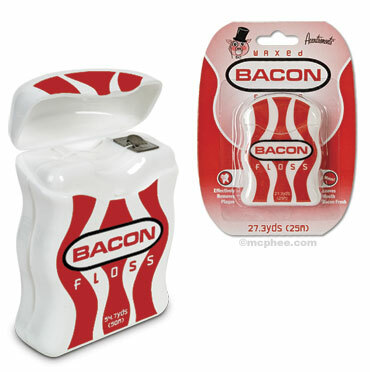 I personally think it’s taking bacon a step too far, however if it gets you to floss, I suppose it can’t be that bad. What do you think, would you use bacon floss? Great stuff! There’s actually a few other flavors I’d like to see on floss. Maybe it’d get me to floss more. Love the blog. Found it through Ragamuffin Soul. I’ve linked to you from mine. Sick. I love bacon (Ashley Sowards used to say I reminded her of the Beggin’ Strips dog…) but I daresay the point of flossing is to leave your breathe feeling minty fresh. Not bacon-y. Now a fruit flavor might be appetizing, but I would definitely say no to bacon! Nope, I’d never do it. Fake bacon flavors always just taste like that liquid smoke flavor that you use to make things taste like they’ve been grilled when they haven’t. Hey!! I just got your comment, and didn’t have your email address, so awkwardly- I’m replying in this comment. But, I use corel paint shop pro if that helps you! by the way- the bacon floss cracks me up!